The Normandy cemetery overlooks the coastline of Omaha Beach. On our return to Rennes, the capital of the region of Brittany, we happened upon the Brittany cemetery. It is much smaller and quainter than the Normandy cemetery. The grounds are beautifully kept with gardens, hedges and large trees. Both cemeteries have nondenominational chapels. I hope you enjoy the slides. People who lead a solitary existence always have something in their hearts which they are eager to talk about. 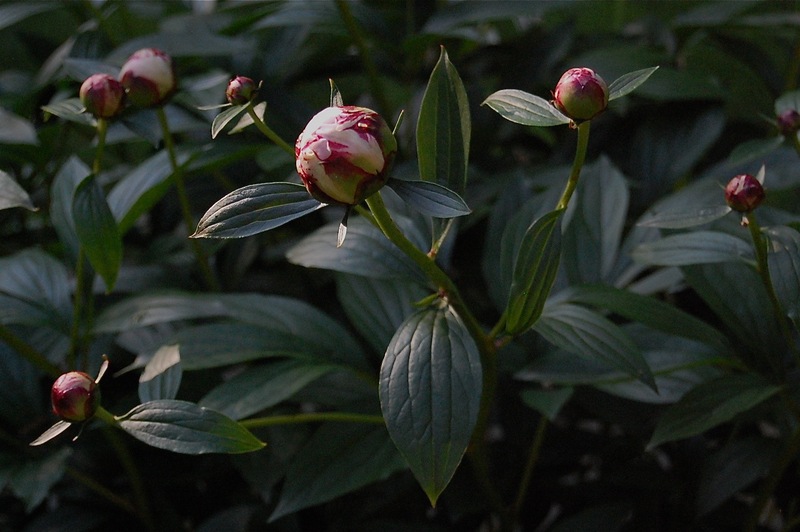 A late bloomer, this peony lags behind the more brilliant pink peonies in the neighborhood. There are three of these ferns in my garden. They come out in the Spring and die back in the Fall every year at exactly the same time. They are clockwork. Some gardeners call them the “Tried and True Plant”. They sell out quickly in nurseries. This Memorial Day weekend the trials and tribulations of war veterans are very much on our minds. On Memorial Day we commemorate the soldiers that have fought in the Revolutionary and Civil Wars and the wars following World War I. Our history lessons have clearly underlined the patriotic importance of the Revolutionary War. We know that the Civil War was fought to free the slaves, although we are also aware there were economic reasons for this war as well. There are World War II, the Korean War, the Vietnam War, the war in Iraq and Afghanistan and some I have forgotten such as the Spanish American and Mexican American wars. We are certainly not at a loss for wars. Each war took place for a reason. Hardly anyone questions the justification for World War II or better known as the “Good War”. In contrast, the Vietnam War is a blemish on the records of the American history books. We don’t really understand the reason we were even there, but there must have been one. It was a brutal war, as they all are, and young men were subjected to horrible methods of guerrilla warfare in the jungles, for which they were totally unprepared. To make matters worse our veterans returned home and were hardly recognized for their service. When they got off the boats or planes there were no salutes, no fanfare. Getting back to our Latin foes, I wonder how many teachers and students know in our schools today why the Spanish American and Mexican American Wars were fought. It’s hard to believe the United States had a war against Spain. That’s incredible! Good old Spain! How could we possibly have fought a war with Spain? From what I understand we were helping the Cubans get independence. At the same time it was a convenient way for the United States to buy Puerto Rico from Spain after the war. A purchase we would soon live to regret. No one imagined the Puerto Ricans would flood Manhattan and the Bronx causing more racial tensions and social and tax problems for white American citizens. Then there is the Mexican American War, justified or unjustified, depending on which side of the Rio Grande you stand, or the “Wall” so gallantly built by the Bush Administration. Today we have a war in Iraq and Afghanistan, a war against the Taliban. These are wars in which we are no longer fighting against one country but against terrorists spread out all over the world. Every night on the “News Hour” they flash the young men and women who have lost their lives in Afghanistan. The numbers just keep growing while the reasons are less and less clear. As I look back in time I really doubt if the benefits reaped from these wars outweigh the loss of lives. How we can morally accept the black and white point of view taken on the fatalities of war? When it is an American life it is tragic, and yes, indeed it is! Yet when it is the life of the enemy, it is O.K, because without the loss of life of the enemy we would not win the war. For the soldier it is a matter of life or death. As Baumer, the main character of All Quiet on the Western Front says; “It is not against men that we fling our bombs…when Death is hunting us down. ‘we can destroy and kill, to save ourselves, and to be revenged’. Baumer clearly shows how the black and white view is a fallacy when he talks about the French and German soldiers: “almost all of us are simple folk. And in France too, the majority of men are labourers, workmen, or poor clerks. Now just why would a French blacksmith or a French shoemaker want to attack us? No it is merely the rulers.” To which his friend Tjaden asks: “Then what exactly is the war for?” This is really truly the question? Why do we have all these wars? If war has been inevitable, then maybe on Memorial Day we should be remembering the fallen young people who lost their youth and their lives all over the world throughout time, be they Japanese, German, Spanish, Mexican, Vietnamese, Afghan, Iraqi, and yes, I hesitate to say it, a Taliban soldier. If we remember the injustices of war, on both sides, and all the lives that have been lost, maybe we will find a way to put an end to the madness.